United States Vice President Mike Pence briefs the media during the Munich Security Conference in Munich, Germany, Saturday, Feb. 16, 2019. U.S. Vice President Mike Pence strongly criticized European allies Saturday for their stance on Iran and Venezuela, in a speech at the Munich Security Conference in Germany. "The time has come for our European partners to stop undermining U.S. sanctions against this murderous, revolutionary regime. The time has come for our European partners to withdraw from the Iran nuclear deal," Pence told delegates. He also called on allies to recognize opposition leader Juan Guaido as the legitimate president of Venezuela. More than 20 European states have done so, but the European Union has stopped short of fully recognizing Guaido as president. Disputed president Nicholas Maduro is widely accused of vote-rigging to win last years' election, while the country is mired in poverty and hyperinflation. "Once more the Old World can take a strong stand in support of freedom in the New World. Today we call on the European Union to step forward for freedom and recognize Juan Guaido as the only legitimate president of Venezuela," Pence said. China repeatedly was singled out by the vice president as a threat to the United States and its allies. "The United States has also been very clear with our security partners on the threat posed by Huawei and other Chinese telecom companies, as Chinese law requires them to provide Beijing's vast security apparatus with access to any data that touches their network or equipment." Pence repeated Washington's calls for European NATO allies to do more to meet their military spending targets — and cautioned against developing economic links with Moscow, such as the Nord Stream 2 gas pipeline currently under construction between Russia and Germany. 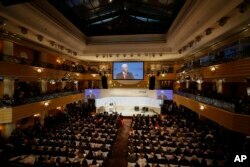 United States Vice President Mike Pence delivers his speech during the Munich Security Conference in Munich, Germany, Saturday, Feb. 16, 2019. "We cannot ensure the defense of the West if our allies grow dependent on the East," Pence said. Moscow's Foreign Minister Sergey Lavrov took the stage later Saturday, and said Europe was losing out because of its stance on Russia. "At a time when the Europeans allowed to draw themselves into a senseless standoff with Russia and incurred multi-billion-dollar losses from the sanctions pushed for from overseas, the world is rapidly changing. Actually, the EU has lost its monopoly on the regional integration agenda," Lavrov said. China's senior delegate did not respond directly to the accusations made by Vice President Pence, but instead he offered a defense of multilateralism. "Our world stands at a crossroads and faces a consequential choice between unilateralism and multilateralism, conflict and dialogue, isolation and openness," Yang Jiechi, a senior member of the politburo and a former Chinese ambassador to the U.S., told delegates. 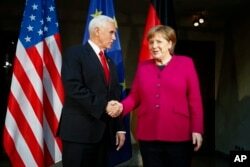 German Chancellor Angela Merkel, right, welcomes United States Vice President Mike Pence, left, for a bilateral meeting during the Munich Security Conference in Munich, Germany, Saturday, Feb. 16, 2019. Those sentiments were earlier echoed by German Chancellor Angela Merkel, who strongly criticized U.S. President Donald Trump's claims that Europe was taking advantage of America on trade. The Munich Security Conference is seen as a key annual forum for world leaders to discuss global security concerns and conflicts — both in public and in private — in dozens of closed-door meetings taking place inside the venue. The atmosphere this year is one of apprehension, according to analyst Florence Gaub of the European Union Institute for Security Studies. "There is still a lot of grief over the old order being gone where everything was much more predictable, or at least appeared to be more predictable. So that's slowly setting in," said Gaub. The tone of the conference speeches suggests that even among allies, tensions over a changing world order are no closer to being solved.